Beached is a sculptural celebration of one of the oldest methods of manufacturing still used today – sand casting – while also offering a critique on our throw-away society. 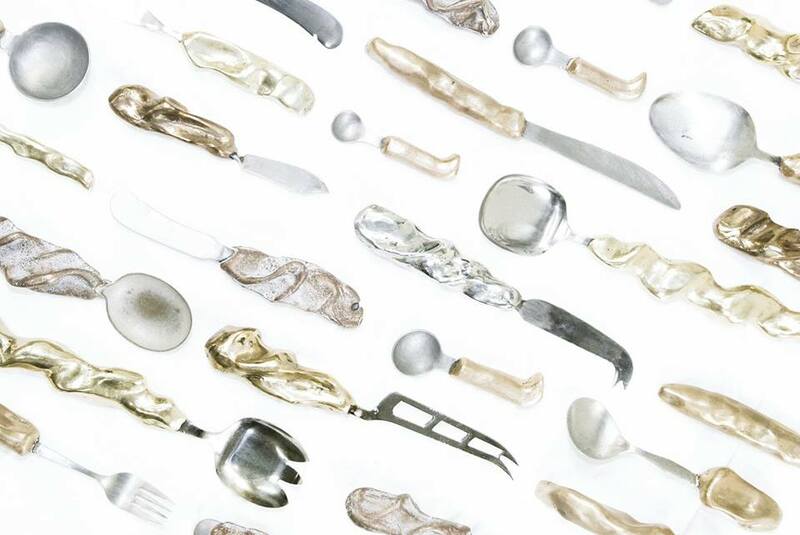 Beached is a collection of preloved utensils, thrown away in an effort to ‘keep up with the Joneses’. Each utensil, which was previously mass manufactured and then discarded, has been individually redesigned into a new functional object. Upcycled through the ancient method of sand casting, these utensils transform from ‘junk’ to bespoke pieces remade in bronze, brass and German silver. In a world of mass manufacture and planned obsolescence, the roles of designers and artists are not always to design something new. It is often more important to work with what you’ve already got, to think of how to redesign what pre-exists and to disrupt the way in which we consume for the better. Ailie is a Melbourne based designer, who studied Industrial Design in Melbourne and Product Design in Dresden. She has worked across numerous design disciplines in both Germany and Australia, and has exhibited previously in Sydney and Melbourne. Waste and consumerism are consistent themes in her work.